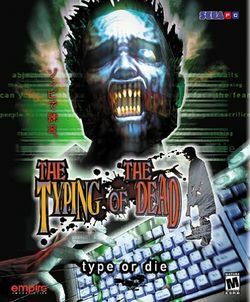 The Typing of the Dead is an arcade game (later ported to the Dreamcast, Microsoft Windows and PlayStation 2), released in 1999 based on The House of the Dead 2. While the latter is a standard light gun shooter, Typing replaces the gun with the keyboard. While the game is an educational game, as it requires players to enhance their typing skills to be successful, it has been praised by critics primarily for its comedic content. The plot of the game follows that of House of the Dead 2 almost completely. The story begins on February 26, 2000, where another zombie outbreak has occurred and several AMS agents have been dispatched to investigate. The player can control two characters, James and Gary, who are first sent to find the original game's "G" before being tasked with restoring order. Responsibility for the outbreaks is soon traced to "Goldman," a banking tycoon and scientist who is attempting to end human control of the earth. Much of the game revolves around destroying Goldman's creations, concluding with the final boss, "the Emperor." There are three possible humorous ending sequences, dependent on how the final questions asked to defeat the Emperor were answered.